Negotiating a 1:1 meeting is easy compared to a meeting with multiple users, but your Zoom.ai assistant can handle it. First, we need to clarify a few things: group meeting is defined as 3 persons or more. Just include a list of attendee names separated by a comma when requesting a meeting. eg. "call with John, Alice and Henry next week"
Invitees are able to see what times others have already selected. Your invitees can also upload their calendar so they can see conflicts. 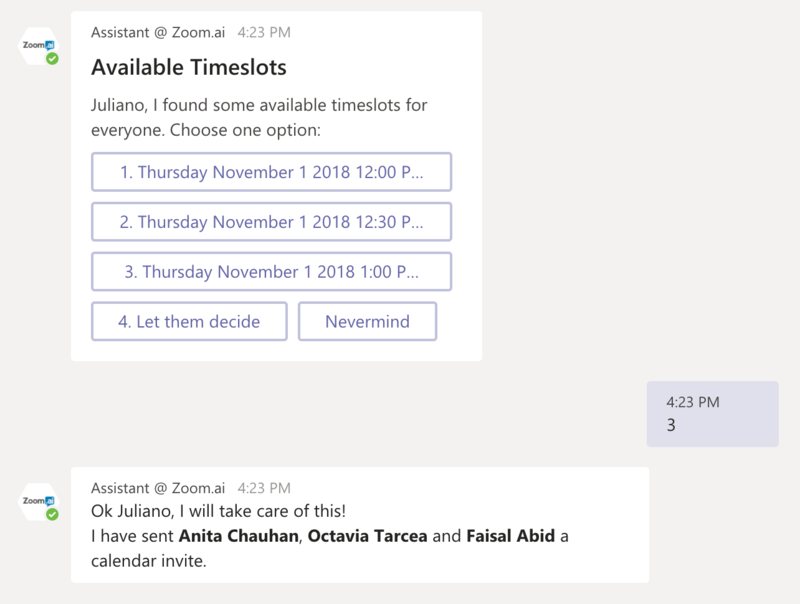 If all attendees are Zoom.ai users from the same organization, you'll be able to select a time that works for everyone based on shared availability right away. If the group invitees include external invitees then your assistant will send your availability to all invitees separately, suggesting that users select at least 3 times that work for them. Once at least 60% of invitees select a time, the meeting will be booked to ensure that the meeting can move forward frictionlessly. All attendees will be notified and receive a calendar invite. Please note that you can also create "teams" to manage a frequently used group of attendees.